Pies and tarts are usually given a wide berth by most people because of the perceived difficulty in making the base. To be honest, it is a bit cumbersome but only if you don’t have all the ingredients set out from the beginning. If you’ve organised yourself and have everything you need in front of you, then I guarantee it won’t take much time. If you don’t, and are running around looking for stuff in the midst of everything, you could take a whole day to just make one pie. So here I have detailed a step by step pictorial process that should make it very easy for you to make a pie base and wow your guests. It’s a recipe I’ve picked up from Irish chef Rachel Allen from her Bake! show and it never fails to impress. You will be directed to this post for all shortcrust pastry requirements on the blog from now. This recipe uses egg, which gives it a rich flavour but if you don’t want to use egg, you can bind the dough using chilled water, about 4 tablespoons, poured one at a time to gauge the right consistency. The dough should not be too moist. As you will see below, I have improvised on the baking beans requirement for the blind baking component of the dish. Instead of spending tons of money on that, I stopped by a roadside stall in north Bengal selling pottery items and picked up mini clay balls by the kilo (unglazed of course). They cost me just 200 rupees ($2.8). It’s not necessary to buy expensive stuff to cook well. You can keep improvising and have fun with your creativity along the way. If you’re using your hands, rub the chilled butter into the flour mixture with your fingers till the mixture looks like breadcrumbs. 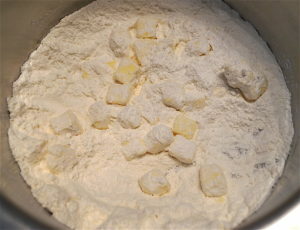 Whisk the egg in a small bowl and add to the mixture and mix till it just comes together and loses the dry flour look. Don’t knead into a firm dough. 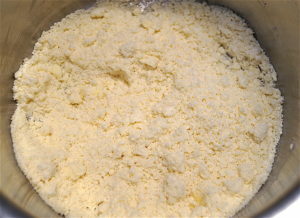 If using a food processor, add the butter to the flour and salt mixture and whizz till it looks like breadcrumbs. Then add the egg and whizz till it comes together. Tip the mixture over onto a sheet of cling film, wrap tightly pressing the mixture into a circular dough and chill in the fridge for 30 minutes. Remove from fridge. If the chilled dough is too hard, wait for a couple of minutes, it will soften. 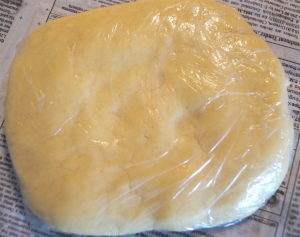 Place the dough between two sheets of cling film and roll to approximately 2 mm thickness. It has to be large enough to cover the entire tart case all the way to the top rim. 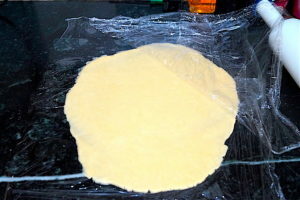 If one sheet of cling film is not enough to cover the dough when rolled out fully, use two sheets, joining the two to form a large sheet each for the top and the bottom. 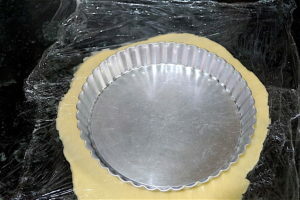 Remove the top sheet of cling film and tip the rolled dough, exposed side down, into a 9 inch diameter tart case and line the case with the pastry properly, cutting off the extra bits that go over the top. Remove the rest of the cling film. 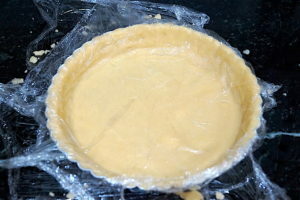 Chill the lined tart case in the fridge for 10 minutes for the pastry to firm up again. This is optional but highly recommended. Remove from fridge and cover the pastry with parchment paper or butter paper. 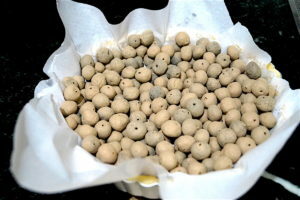 Fill with ceramic baking beans or uncooked rice or kidney beans (rajma) or chickpeas till it comes up the sides. (This is called blind baking and it’s done to ensure the pastry is not undercooked. 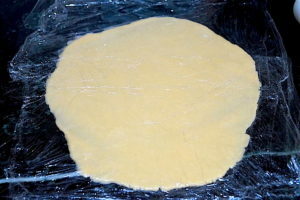 Wet pastry with wet filling will ensure the pastry does not cook properly. Also, the purpose of the baking beans is to ensure the pastry does not bubble up from the bottom and the sides don’t shrink or crack while baking). Bake in the middle rack of a preheated oven for 20 minutes at 180°C with only the bottom heating on. Take the tart case out of the oven and remove the paper and the beans. Your pastry is done and awaiting its filling. 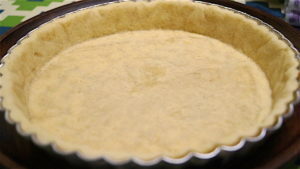 If you’re not going to fill the tart case with something that requires additional baking, then place the pastry back into the oven and bake uncovered for another 5 -10 minutes so that its fully cooked. Important notes: Make sure your butter is chilled before mixing it with your flour. 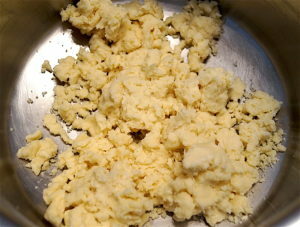 Melted butter will not give you a nice crumbly texture and will only make the pastry shrink while baking. To ensure chilled butter, cut the butter into cubes and keep it in the fridge for 15 to 20 minutes if you live in hot climate. You must chill the pastry in the tart shell before baking for the same reasons as the above.